For the approximately six of you who have read my previous, somewhat (mostly?) pretentious, overly-hyperlinked reviews here, you’ll recall my contention that if Christians should prevail at any sort of filmmaking, it will be documentaries. That’s because we Christians have stories to tell, and documentaries are about story first. Cinematography is a nice to have, and good audio is helpful, but if you can reveal the threads of a great story, you’ve made a really good documentary. I bring this up because a production company that makes really good films may have discovered a financially-successful model that greys the line between documentary and fictional narrative storytelling. The Erwin Brothers — no not those brothers, these brothers — are filmmakers whose last two films retell real stories in a “based on” narrative format. It’s a tactic that builds a moat around the story, because attacking the story would attack the truth. Does the story sound a bit hokey? Feel a bit too “on the nose”? Well, that’s what happened, so I guess you’d better consult the Great Author about maybe toning down the hokiness. C’mon, everyone knows in real life, pacifists who won’t lift a gun don’t save seventy five people on the frontlines of a battle. Real life doesn’t have people who have done despicable things finding peace and forgiveness in the Cross. It’s all a bit unbelievable, isn’t it? I know my life is unbelievable. And yet, I’ll admit my biggest criticisms about I Can Only Imagine lie in this vein of criticism. It’s a tight two-hour script. Really tight. So tight I wonder if I’m watching what happened when it happened, or if it’s the very concentrated movie version. Then again, if those are my criticisms, I have to first comment on what this film accomplishes — it’s an exceptionally well-shot, well-acted, well-edited film, created by craftsmen who understand what makes a good shot and doesn’t. I Can Only Imagine tells the story behind the biggest song in the history of modern Christian music. The song was written by Bart Millard, lead singer of the band Mercyme. It’s the only Christian song to be certified double platinum by the RIAA. Millard often tells people the song took ten minutes to write. But the film indicates it actually took a lifetime. Bart was a product of a broken home, regularly beaten by his father several times a week. As Bart grew and found solace in music, his father was diagnosed with cancer and became a Christian. Bart’s song imagines what it will be like to be in heaven with his father, a forgiven and redeemed saint. There’s no doubt the Erwins are influenced by the shotmaking and storytelling of Steven Spielberg. Their use of camera movement to find elements of a story and then compose a brilliant master shot is indelibly Spielbergian. One shot opens at a place of business, moves to young Bart riding his bike in front of it, follows him as he picks something up there, and then watches Bart leave. It’s the sort of shot very few people will recall as masterful, but it took a long while to light, block, and track. Well done. Their cinematographic choice to stay tight — like 50mm closeup tight — on subjects paid off. It was a telegraph to audiences that this is “real”, that we are to search faces and listen closely to lines for emotion. 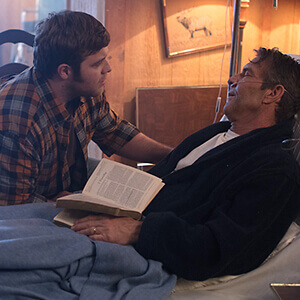 And, when you have actors as good as Dennis Quaid involved, you’ll find it. And, when it comes to making performing artists, bands, and singers look so good, that’s just thousands of hours of experience: the Erwins, in their former life, made music videos for artists like Amy Grant and Michael W. Smith, and it shows. I Can Only Imagine has the look and feel of someone who understands live performance. The film’s cast does a great job of letting us in on the ride. 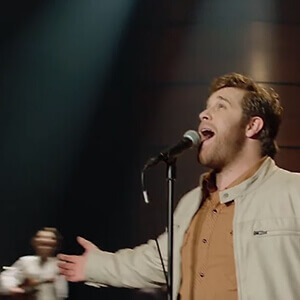 The Erwins made a wise (and brave) choice of letting J. Michael Finley sing (instead of lip-sync) in the movie, which was a gateway to allowing us to believe the film’s authenticity. Trace Adkins may not be acting. I’m not sure. I think he’s just being Trace Adkins reading lines, but that didn’t keep Jack Palance from getting parts, and it won’t keep Adkins from them, either. He provides a gravelly gravitas to everything. I wonder if I can get him to be the voice of my Google Maps. I don’t want to undersell Quaid’s excellent performance, but I don’t want to oversell it, either. It’s the sort of part every actor wants, but every really good actor should do well in. We stay tight on Quaid’s face, letting him do some actor’s heavy lifting, and he’s more than capable of carrying the load. It’s the film’s edit that may be the unnoticed star of the film — keeping sequences popping, letting punch lines and big lines hit at just the right time. This film moves nimbly because someone put it together really well. I would guess there’s a longer, slower, three-hour version that breathes differently. And maybe that’s the film I wanted to see. I wonder a bit if there was some watch-tapping going on as the filmmakers kept their story to just under two hours. I wonder if showing us a bit more of Bart at his low — in his room, in the hospital, lamenting the loss of his mother, even on the running from his past on his motorcycle — would bring more of the implied darkness and pain onscreen. I think what I’m asking for is a less commercial, slower film, which might not have been as good, which is why the Erwin Brothers are making kajillions and I’m making tiny films. It’s nitpicking an excellent film which tells a great story and made me cry. And by the way — audiences love’em. Both of the Erwins’ last two films, Woodlawn and I Can Only Imagine have received an A+ score from Cinemascore. If you look at the list of other films that have done that, you’ll see the sort of company they are in. If you’re like me, a Christian who complains a lot about how bad Christian filmmaking is, open your swear jar or break out your toll change and go see I Can Only Imagine. The Erwins are on the crest of a new wave of Christian filmmakers — folks who understand the screen, filmmaking, and storytelling. And if you’re not a Christian, you’ll like this story and how it’s told. The Erwins don’t seem particularly interested in making you a Christian with their film. They just wanted to make something beautiful, and they did.